This very comfortable and spacious Purgatory Townhouse studio is located at Purgatory Resort. The perfect location for skiing Purgatory, just a short walk to the ski lifts and ski plaza. Enjoy the peace and quiet of the mountains during the summer months and incredible fall colors. A short and beautiful 25 minute drive to Historic Downtown Durango, CO which offers abundant shopping, dining, and entertainment. Soak in the hot springs at Trimble Hot Springs visit Mesa Verde or ride the Durango and Silverton Train. More adventure close by in Silverton, CO.
With a queen bed and full size sleeper sofa this unit can comfortably sleep 4. Newly remodeled bathroom. Fully equipped kitchen. Cable TV and Free WiFi. Wood burning stove. Great location at Purgatory Resort a short drive from Historic Downtown Durango, Colorado. 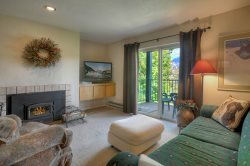 This spacious studio condo is located within walking distance to the ski lifts at Purgatory Ski Area. Only 25 minutes from Historic Downtown Durango where you can enjoy many fine restaurants and abundant shopping. The perfect location to enjoy the San Juan Mountains. Easy access to many activities including skiing, snow mobiling and snow shoeing in the winter months and mountain bike trails, hiking trails, jeep trails and fishing in the summer. A wonderful location any time of year. This is a great little studio condo on the top floor with a nice balcony looking up towards the ski runs. It's an easy walk to the lifts. The studio is small but plenty of room and the bathroom is a good size. Great kitchen with a full fridge. What else do you need?